I was poking around on Pinterest lately because I needed a break from social networking sites and I saw this picture. I know it’s not terribly profound, but the thoughts that ensued caused me to pause. 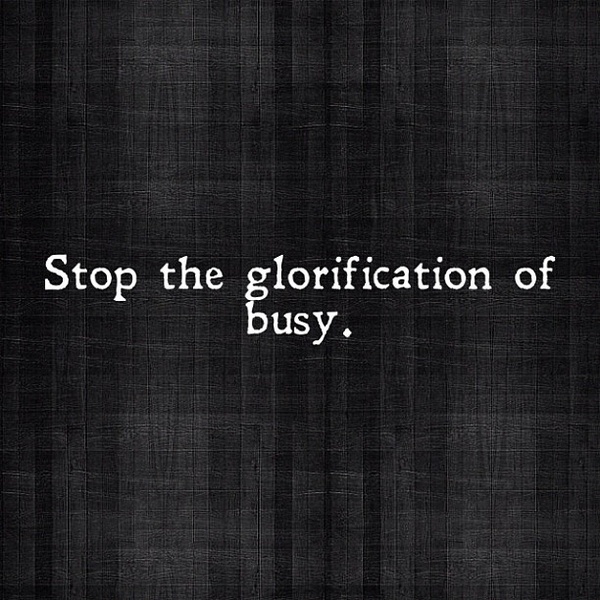 It’s undeniable in the United States we glorify busyness. If one doesn’t appear to be actively engaged in something people assume the individual is lazy, slothful, or uncaring of their work. Meanwhile the person who is always rushing about and on their feet is presumed to be skillful, devoted, and professional. It’s the sad remnants of the Protestant work ethic taken to a very extreme. However, I’m not satisfied with that conclusion. Why does the United States culture glorify busyness? How did we interpret “busyness” to mean “hard worker”? I think that with the extremist notion of the Protestant work ethic we’ve misconstrued busyness as industrious. We forgo the connotation of the two words and look solely at the denotation. We’ve learned to observe the shallow means of something done rather than something habitually done. Part of the observation comes from how our culture’s developed. We’ve developed into a culture that demands instant gratification. I’m not sure if there is a steadfast solution to changing this mindset on a large scale, but I do know it can be changed on a personal scale. The drawback of instant gratification isn’t just a decline in quality of things, but also an appreciation for things, from my experience. If one expects everything to happen on the double there’s no appreciation for how it happened. A great example of this is small children with treats. A small child doesn’t care how the treat was made, who made it, what costs and efforts occur; the child wants the treat and that’s all. However, when the small child is made aware of how to attain the treat—usually when they’re old enough to understand—then there are grounds for appreciation. Sometimes this means teaching the child to make the treats, having them pay for the treats, and so forth. When there’s awareness of the effort it takes to acquire something, there’s more appreciation for it than without the awareness. It is with awareness where I draw the line between busyness and sedulity. When one is sedulous the person is more thorough, more aware, more thoughtful of their work. They work hard not for the sake of producing something, but to produce something meaningful. A sedulous person understands hard work and appreciates others’ hard work. A sedulous person aims to do their best. It’s not to say one can’t be busy and sedulous, mindful, or that that busyness must equate to thoughtlessness and apathy. I’ve witnessed people who are busy and sedulous as often as the opposite. It takes awareness to discern when one is doing what. In our self-awareness we can discover our limitations and take action. A great example of this is why my blog became relatively inactive. I managed to pile several projects on my plate with what seemingly yielded little results. I also felt very discouraged with the Neo-Pagan and other communities. I recognized my burn-out when I realized I was just writing things for the sake of posting. I wasn’t working purposefully. I was burnt out. I spent a bit of time meditating over how to handle my burn out. I finally decided to back away from all my projects and affairs save one project and what was essential to conduct business. I threw a lot of energy and planning into that project. I set up the social network accounts, set up graphics after a few failed attempts to find the appropriate artists and back-up planning, focused on more affirming and inspiring messages to keep my stamina, and set up the blog for the project as it neared completion time. –Plan out a specific project. Take a project and list the main goal and its deadline if possible. Then list the steps needed to attain that goal. List every goal in its fullest detail. This includes how much time it will take to complete, the resources needed, any possible people / places /things that will contribute to that vision. Don’t leave out anything, even if it seems minute; this can be edited after you examine it. –Look at possible “down time” in each step. Even though this time will factor into the project it will serve in sorting out the time schedule. Where there’s nothing going on during one stage of the project it may be the opportunity to work on a different part of the stage. It also provides a rest period as needed. –Reward yourself for completing a stage. It doesn’t have to be a huge reward like a night on the town (save big rewards like that for when the entire project’s completed), but you should reward yourself as an incentive to keep going and as a way to relax. –Remove distractions. For many, myself included, it means not spending time on social networking sites. In fact I used certain sites as a reward for meeting certain goals. –Create an inspiring and motivating environment. Look at where the task is performed. Is there anything to keep you going? If you remove any distractions does it feel possible to tackle the task? Sometimes a progress chart of sorts will motivate, sometimes one of those cheesy motivational posters help folks, or even the focus on the reward for yourself will work. -Celebrate the completion of a goal. When the goal is finally completed, give yourself a treat. If you treated yourself for completing certain tasks along the way make sure the treat at the end is larger. I found that with a method to keep on task I wasn’t just busying myself. With a method to reaching a goal and breaking it up into tasks I was more aware of what I was doing. I was in more control of my mind and found more of my equilibrium. Categories: Life Lessons, My Way of Ma'at | Tags: busy, Kemetic, Ma'at, NeoPagan, sedulity | Permalink. When I first wrote this blog post I was dealing with a lot of worry. I worried that I wasn’t going to ever know financial stability, I worried that my life would never be what I wanted it to be, I worried that I would live my life alone, I worried about everything I hoped or dreamed would be unfulfilled. Basically I worried about everything. My remedy, or what I thought was the remedy, was to remind myself of the Reiki Principles of Mikao Usui, namely not to worry. When I contemplated how to handle my worries I ended up taking a rather over-simplistic view. At the time I attributed much of my worry to idea I wasn’t willing to surrender. Given how I’m a person who doesn’t surrender (or at least not without a fight) I knew trying to learn how would prove quite the challenge. What I’ve learned instead was the difference between surrender as submission and surrender as release. When most people think of “surrender” they think of submission in some fashion. I thought the idea of surrendering was an act of submission, and sometimes it can be. I know that the past year has taught me about the act of surrendering as a form of release. I’ll admit I haven’t been in a happy place mentally or emotionally for some time. As I look back on my blog posts I’ve seen it bubble to the surface. I was completely in a living situation I never wanted to revisit and surrounded by extremely unsupportive people, though I believed otherwise. I’m sure the same could be said about me while those parties in question truly believe they were supportive. I saw otherwise when I set out to start my own business. I researched everything I could think of to learn, I looked into what regulations by which I needed to abide, and even how much money I would need to start my venture. I started to ask my friends who ran their own businesses, and the truth stared me down. One I had put much trust into offered to “buy me out” despite her cries of how I need to be independent. Sometime later we had a long conversation about her offer and other offers where I mentioned my concern about how it seemed contrary to my “quest” to be independent. “We’re all dependent on someone to some degree,” is how she responded. Even though I agree with this sentiment in a normal circumstance, given the conversation it unsettled me. I worried about the implications and what to do. I performed a Tarot reading for myself, and it told me what I knew I had to do, but wasn’t ready to do: let go. I stayed a little bit longer until she tried to humiliate me in front of her friends. I blew up and ended the friendship. In that moment of my ego I finally let go of the friendship that was damaging me. If you feel that you cannot give up your free will- the right to make your own decisions- then, you still have residue of Ego, which is part of the personality. The Masters lay great stress upon the need for self-surrender […] Surrender is not easy, nor can it be achieved through a miracle. It is a slow, painstaking, labor of Love. Not surrendering may still be an act of Ego, but I don’t feel that’s anything to shun right now. I still believe it’s a long process that requires lots of love. More often than not it’s been self-love. I had to love myself enough to no longer tolerate sick behavior. I had to love myself enough to know this woman would hold our mutual friends emotionally hostage and that I would lose friends in this process. It hurt to see her expect my friends (it’s been a year and I’m still hearing from friends about this situation) to “rescue me” even though she claimed I seek that and chided me for it. All I’ve done is all I can do: speak my side when asked, cast spells to sever our ties, prayers, and protect myself. After a year of diligence I’m almost free. In the span of that year I worried about many things. When I paid my doctor a visit for an ear infection I got an eye opener: my resting heart rate was through the roof. She examined me to the best of her ability and I spoke with her about what was on my mind. I was blessed in my doctor also held a degree in psycho-medince. We came to the conclusion it was the stress from my worry and some underlying mental health issues. All the stress I put on myself from worry (and later I learned the product of my mental illness) took its toll on my heart. I had to pull myself together or these things would be the death of me. I finally sought help through both a therapist and my own research into my diagnoses. Each time I saw something that endorsed feeling whatever I’m feeling and not fight it. While I wasn’t surrendering to the attack itself, I was submitting to the idea of having one. No more could I fight the attack, but to pull alongside it and feel what I needed to feel. My partner understood and has been one of many ways for me to submit to my attack. I’ve also developed other ways of handling my impending worry from awareness and tackling the causes of my worry to seeking a creative outlet for it when solutions aren’t apparent. My writing, painting, drawing, calligraphy, and now scrapbooking help me release. I know tackling my worry is still a work in progress, but now I have more experience and insight with it. More than anything, what has been important for tackling my worry was to submit to a routine. In this routine I approach my shrine with offerings, time with Het-Hert, and sometimes my worry. I submit to Her and to Her I give my worries. I pray for help when I need it, and sometimes I pray as a form of gratitude. I surrender to Het-Hert. In these times, while we feel there is much to worry about, can also prove more fruitful. These times can become a great opportunity for our nation, or at least our communities, to grow in a healthy way. All we need is faith in the forces at work as well as our own. Categories: Life Lessons, My Way of Ma'at, New Perspective | Tags: Kemetic, life lessons, Ma'at, NeoPagan, surrender, worry | Permalink. Natron is a salt that originates from the Nile river. In Ancient Egypt this was used from drying out a mummy to purification rituals. Everyone had access to natron since everyone could access the Nile. I know there are quite a few pages devoted to making your own natron, each one proclaiming to seem like authentic natron. Having never been to Egypt and tried true natron to confirm or deny these claims (don’t expect to see natron for sale worldwide either; it’s illegal to export natron) I’ll keep silent on those claims. I will say I make my own since it’s very easy. I tend to eyeball the recipe so I don’t have exact amounts. 1. Combine salt and baking soda into a heat-safe bowl. Set aside. 2. Boil the water. Add the water to the mixture in the bowl until the mixture dissolves. 3. Let the water evaporate. As I said it’s a very simple recipe and probably not different than any other recipe out there. My method does take some time to let the water evaporate, so make proper time preparations as well. If you’ve never made natron before also note it will dry into “clumps” or “pellets”. This is ideal and isn’t a problem. 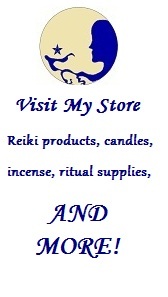 Categories: Craft Friday | Tags: Craft Friday, Kemetic, NeoPagan, shrine, tools | Permalink. –Use extra dishes. Own a set of fine china that’s never put to use? Have some ordinary dishes to spare? These are the first places most people look for ritual dishware and the cheapest. –Peruse garage sales. Lots of people try to get rid of their random dishes and dish sets for very low prices, sometimes for pennies! –Peruse thrift stores. It requires more digging than a garage sale, but random dishes are found at low prices as well. –Make a hotep tray. Not only does this handle dishware but it tackles any food issues. For those who don’t know what a hotep tray is can learn more at this link. The issue of acquiring dishware for offerings is probably less of an issue than acquiring food and libations for offering. Luckily, the Ancient Egyptians also partook in the food and drink offered to the gods, so the issue lessens. There are some things to keep in mind when offering that will also save money. –Offer water. This seems like a “no-brainer” because it is. Water was offered in Ancient Egypt and it’s the cheapest libation in developed countries. –Offer foods in season. Foods that are in season are cheaper. –Offer dried foods, such as fruits. These tend to keep longer and thus easier to store. –Have an offering tray with fake food. I’ve heard of people assembling offerings of wax fruits, decorative breads, and other plastic knick-knack food items as a regular food offering. These people seem to be standing, and quite frankly I don’t see how it’s too different from a hotep tray. –If nothing else, offer around mealtime. Offering the gods foods that you will eat at the table seems not only congruent with ancient practices but also saves money. Some of you who follow me know that I kept other blogs like Papyrus and Pedantry and Musings of a Pseudo-Pagan. Simply put those blogs no longer exist. I’ve decided that my writing and my focus needed a massive change, and given my growing satisfaction with wordpress I’d move stuff over here. However this won’t be a simple moving of my blog posts. Given the changes in my spiritual and religious growth I feel my blog should reflect more of my journey. That means there will be updates and revisions that reflect on those posts but add another perspective. I also plan to sound less like an 18th century author compared to my earlier posts. If you look around you’ll also find tabs with links to very specific topics, such as my craft posts or holiday posts. I wanted to make those posts easier to find and access. Basically I want the posts I feel that could contribute to the Kemetic community to be more upfront than my ramblings. This coincides with the vision I’ve always had for this blog and I feel it’s possible to refine on this host. I hope you are as excited about these changes as I am and I also hope you will grow and change with me on the new direction I’m taking.